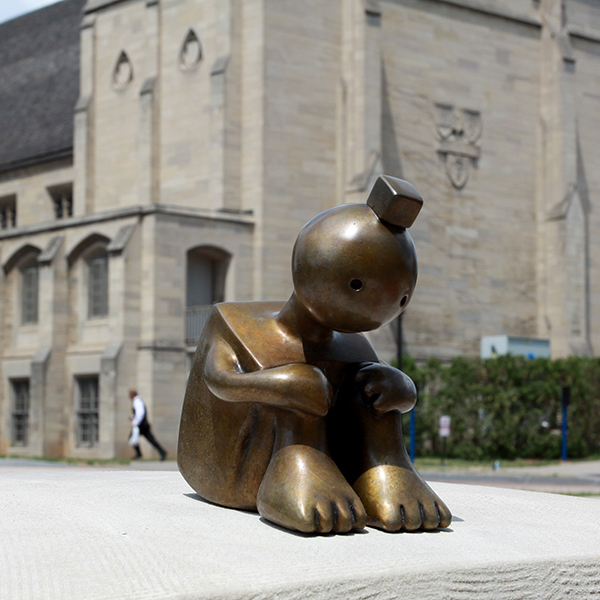 For the Gallery’s Centennial Sculpture Park, Tom Otterness created two heroic figures at the corner – a female sculptor who is carving a male figure from a block of stone. Visit his website, to see images of the work in progress. Watch a video below on his creative process and the installation of the project. Tom has completed major outdoor commissions in the US, Canada, Germany and the Netherlands, including multi-sculpture installations in New York City, Indianapolis, Grand Rapids, MI, and Beverly Hills, CA. His sculptures are in the collections of such institutions as the Brooklyn Museum, the Museum of Modern Art, the Guggenheim Museum, the Whitney Museum of American Art, the Joslyn Art Museum (Omaha, NE) and SFMoMA in San Francisco. He has also created site-specific works for schools, parks and playgrounds, as well as such unconventional venues as a hayfield in Texas and Manhattan’s 14th Street subway station. In 2005, he became the first artist ever to contribute a balloon for Macy‘s Thanksgiving Day Parade. The Memorial Art Gallery’s centennial year is presented by Lynne Lovejoy, with additional support from Robert L. and Mary L. Sproull, ESL Charitable Foundation and Nocon & Associates, a private wealth advisory practice of Ameriprise Financial Services, Inc.